Ecopilas makes a great effort to make available to citizens a wide network of containers for the collection of waste batteries and accumulators reaching agreements with all types of facilities to join as collection points. Our aim is to make our network as close and accessible as possible so that users can deposit their used batteries and accumulators comfortably. Municipal facilities: Clean points, waste collection points, Ecoparks, Green points, etc. Capillary points (also called “distribution points”): all kinds of shops, educational centres, health centres, sports centres, cultural centres, etc. 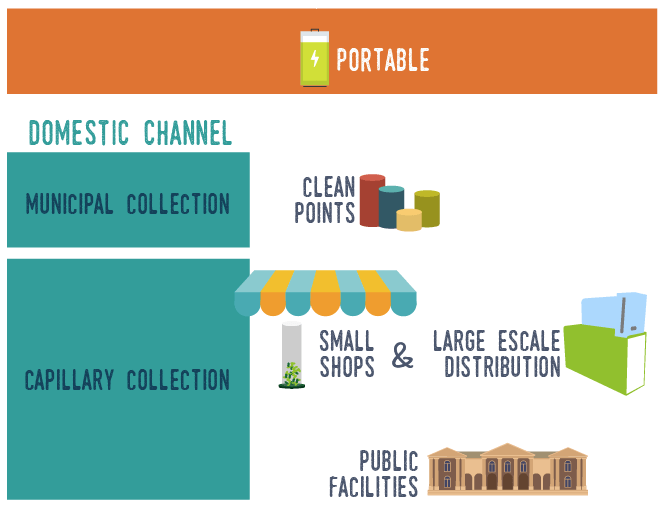 The collection of portable batteries in Ecopilas has as its first collection channel the municipal networks, with 35%, followed by professional and industrial collections, with 34% and those from distribution, with 31%. Ecopilas has a wide range of containers, which adapt to all types of waste batteries and establishments and ensure a very high degree of capillarity in collection throughout the country. The “tube collector” is the most common model of container in the collection network because it is designed for establishments with a high level of user traffic, and thanks to its visibility and unbeatable situation, it is perfect for those consumers who want to get rid of their used batteries. 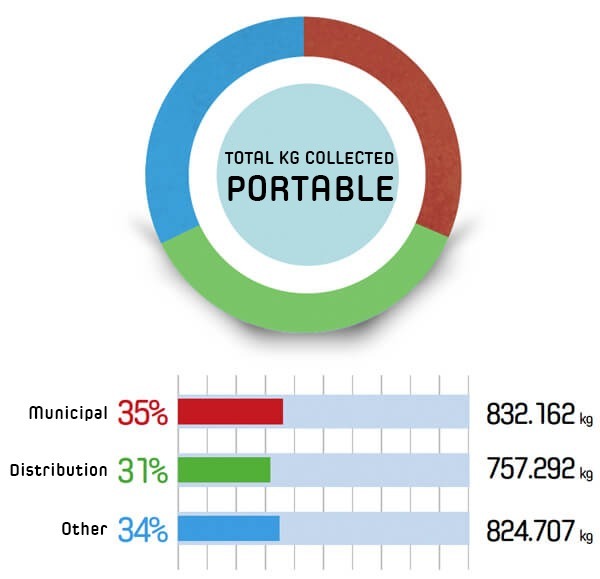 ON AVERAGE, ECOPILAS HAS COLLECTED 126,055,380 UNITS OF PORTABLE BATTERIES IN 2017, REPRESENTING 345,357 UNITS PER DAY, THANKS TO THE HIGH LEVEL OF AWARENESS ACHIEVED IN SPAIN.